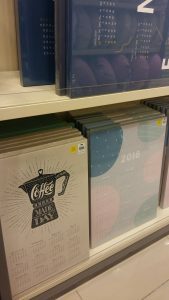 It is only during end of each year or beginning of the new year that calendars, diaries and planners are on sale. 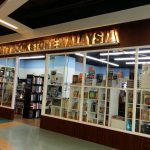 After the new year, the prices would generally be reduced (especially by Popular bookstore) and by February, these items would be off the rack. 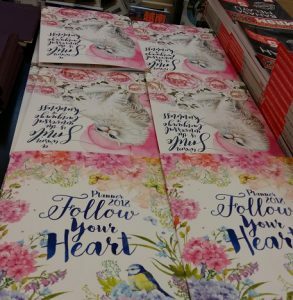 I’ve checked with a few bookstores, they informed me that they would usually send the unsold stock back to the suppliers. The price is RM5.90. I bought it because I love the pastels theme and designs on their pages. I would use it to update bill payment dates, important dates to take note and to plan my mini projects (ranging from cleaning to blog enhancement or dates to take down certain advertisements from my sites). Please read my updated article on Kaison 2019 Table Calendars. Their designs are similar from the 2017 calendar that I have but I love looking at the calendar. Also, I noticed that they would include the last quarter of the previous year’s in their calendar as well. For example, for 2018 calendar, the months of September- December 2017 are included inside. 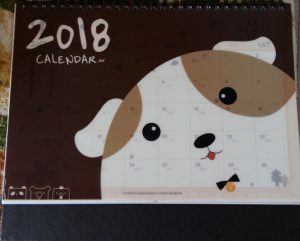 It would be great if they can start stocking and selling these calendars from as early as September 2017 because the calendars can be used starting from September each year right up to the end of the following year. But alas, they tend to stock the calendars only by end of November each year. 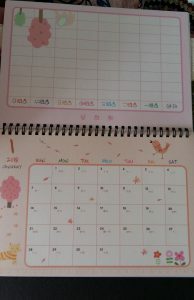 Their calendars carry the Chinese lunar calendar dates which is useful to me because our family is on vegetarian diet on new and full moon dates. 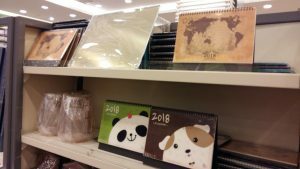 One salesperson told me that he is puzzled that the daily Chinese calendar (the left side on the picture above which usually sells from between RM8.90 to RM9.90 each) are selling like hotcakes and his bookstore sold off most of these calendars already. Reason being is because such calendars contains daily auspicious and inauspicious dates. Even my brother refers to such calendars before deciding if he should go for a haircut. 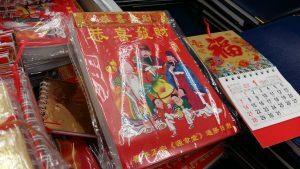 In the past, we used to be able to get a lot of horse racing and the daily calendars like above free from regular Chinese provision, suppliers and those selling prayer items. However, cost of doing business has gone up and profits have gone down so over the years, more and more shops are no longer printing and distributing for free. 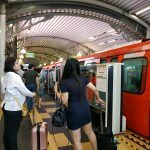 Even if they are giving for free, they may reserve for their ‘special customers’ or upon request or they print very limited stock that runs out early. Hence, many people have to resort to buying them. Well, most of us are not interested in the calendar due to horse racing, even though it is known as such because it contains dates of when horse racing is available. Mainly is because the horse racing calendar would list down school holidays, state and public holidays and dates following the English, Islamic, Indian and Chinese lunar month dates. The horse racing calendar is found in many households in Malaysia because of its deep usefulness. 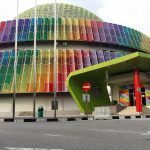 By the way, there is a popular free app called the “Malaysian Calendar” by Yuno Solutions (website malaysiancalendar.com) with the horse racing format which contains all public, school holidays and log weekends in Malaysia. I downloaded the app from Google Playstore. It also contain the Muslim and Chinese dates and months. Quite handy to download on your Smartphone so that you have a handy reference. The only thing is that the app would contain advertisement which is understandable since someone took the trouble to develop the app and provide it for free. However under settings option, there is an option to remove the ads with the low price of RM2.99. You can also plan the dates and I do see my calendar reminder on my phone being sync with this calendar. I noticed the web developer also developed similar calendar apps (Islamic and Chinese calendar) for Hong Kong, UK and Australia, among other countries.